Remembering our Marathon Hero Abebe Bikila ! Mohammed Aman wins 800 meters at world championships. Traditionally it takes rather a long time to be served a cup of coffee in Ethiopia – but things are now speeding up. As coffee plants originate from the east African nation – where they first grew wild before cultivation started in the country more than 1,000 years ago – it is perhaps unsurprising that Ethiopians take coffee drinking very seriously. 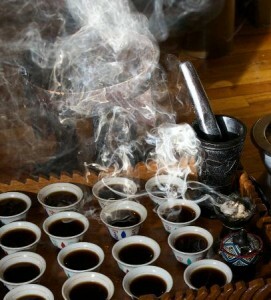 So much so that Ethiopia has a ceremonial method of making coffee at home that continues to this day. The ceremony sees raw beans roasted over hot coals, with each person in attendance being invited to savour the smell of the fumes. The beans are then ground with a wooden pestle and mortar before finally being brewed – twice – in a clay boiling pot called a jebena. And so, as Ethiopia’s economy continues to expand strongly, more people – led by young professionals in the capital Addis Ababa – are instead buying pre-roasted beans, or visiting coffee shops to have their favourite drink made for them. It means boom times for the country’s independent coffee roasters and cafes, who have seen their numbers rise and some are even looking to expand overseas. The family-run Tomoca coffee shop, perhaps the best-known in Addis, lures in customers with the smell of freshly roasted coffee drifting from its chimney. Located off one of the city’s main shopping streets, it has been open since 1953 when it was just one of a handful of firms in Ethiopia roasting coffee. While business was slow but steady for Tomoca during its first 20 years, times were tough when Ethiopia was ruled by a Communist dictatorship from 1974 to 1991. For those 17 years just staying in business as a private company was the priority. Since 1991 though, the firm has made up for lost time, particularly in the last couple of years, benefiting from a rapidly expanding Ethiopian economy, which grew by 9% in 2012 and 10.4% in 2013. With a growing number of people in Addis now having the money – and desire – to go out for their coffee, Tomoca today has five cafes, and its turnover is growing by 70% a year. The company also now has a dedicated coffee roasting plant just outside the city, which supplies supermarkets. Wondwossen Meshesha, Tomoca’s operations manager, says that the firm has finally been able to make some decent money after more than 60 years of building up its name. At Alem Bunna, another of Addis’s independent coffee shops, its marketing manager Getachew Woldetsadick says the city’s cafe culture is booming because young professionals lead such busy lives. “They do not have time to sit at home for an hour roasting coffee,” he says. Yet such customers also say they are attracted to the quality of coffee available. “I come here every day as I work nearby – I prefer this style,” says 27-year-old accountant Tesfaye Abdissa, sitting inside Mokarar, another of Addis’ coffee shops. Mokarar’s owner Tigist Tegene says the secret to the popularity of her firm’s coffee is that they roast it using an old wood-fired oven. “Customers like the shine and flavour this gives the beans,” she says. At the same time, Ethiopians are not impervious to Western-style hipness. At Kaldi’s Coffee, its green and white logo was inspired by US giant Starbucks, after its owner, Tseday Asrat, accompanied her husband, an Ethiopian Airlines pilot, on trips to the States. Mrs Tseday now has no fewer than 22 branches in Addis, which teem with people ordering “short” and “tall” coffees. As well as serving a growing domestic market, Tomoca is now eyeing increased overseas sales. Customers around the world can already order its beans by mail order, and it has a deal with a partner in Japan which sees Tomoca coffee distributed to Japanese restaurants, department stores and cafes. Tomoca’s Mr Wondwossen says the company now wants to sign similar partnerships in Europe and North America, including opening cafes under its own name. “We need to find partnerships as we cannot do this on our own,” says Mr Wondwossen. Closer to home, the firm also plans to expand into neighbouring Djibouti, Kenya and Sudan. Alem Bunna is also on the lookout for foreign partners, to help it expand into new African markets, followed by Europe and Asia. Yet as these small coffee roasters and shops are turning their attentions abroad, they could soon be facing competition at home from the big Western coffee chains. For while government regulations currently prevent foreigners opening cafes in Ethiopia, this rule is expected to be overturned in the near future. Geoff Watts, vice president at Intelligentsia Coffee, a roasting firm in Chicago, says he expects to see many global firms consider entering Ethiopia. “Some of the big coffee chains would be interested as Ethiopia is a market that really appreciates coffee, and consumes a lot per capita,” he says. But those within Addis’ thriving indigenous coffee scene say they are not worried by the potential arrival of foreign competitors. Related Post "Boom times for Ethiopia’s coffee shops"